New Spark Platform can help you collect and publish quality user-generated content in no time! We offer a complete set of tools to help you build and manage your UGC campaigns. Uploading is simple and user-friendly. New Spark Platform accepts hundreds of media file formats uploaded via web, mobile device, or email. Our transcoding system automatically scales to the volume of assets received, and our upload form includes numerous default form fields as well as custom fields for you to collect as much or as little information about submissions as you'd like. Once a photo or video has been uploaded, the Media Factory transcoder generates a variety of thumbnail images as well as a variety of video formats. This will help when publishing content that will displayed on a range of devices. You may also create custom transcode profiles to meet your needs. 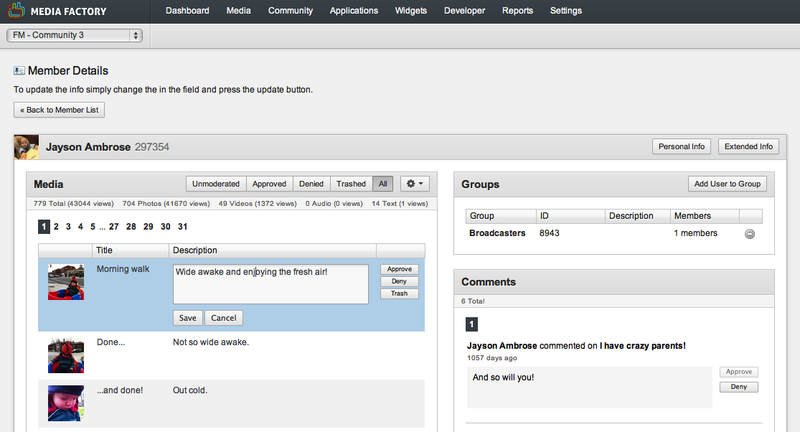 You can also upload directly to New Spark Platform if you have a log in using the top nav Media > Upload. 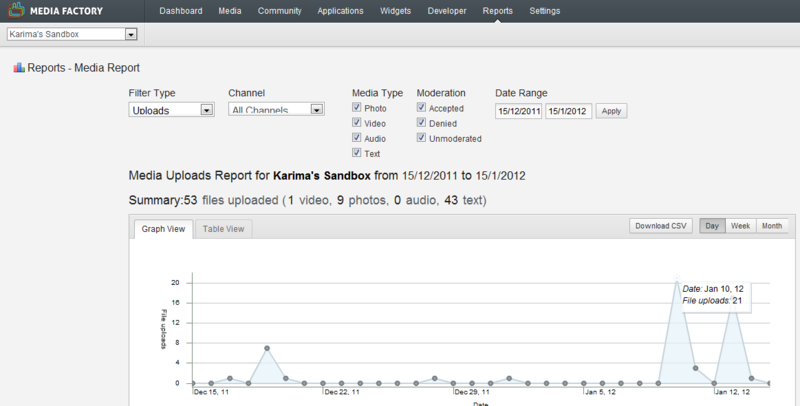 Once your content has been uploaded, you can find find it on the Media Overview page by going to Media in the top nav. By default, all unmoderated items will be displayed, but feel free to toggle through the approved, denied, or trashed headings to see content that is already moderated. You may also use the search on the left rail to refine your media search, and action settings will be activated once an item has been selected . If more detail is required while moderating a video, you can double-click the thumbnail, which will take you to the Media Details page with all the information at your fingertips. Set up email notifications to alert users when their submission has been approved or denied. If content is approved, the user will receive an email with a link to their photo or video. If the content is denied, they will receive an email stating the reason for this decision. Comment moderation is also offered in Media Factory, allowing you to protect your brand. Your upload community is integral to your campaign and the community member's module allows you to scan your user database for insights. Access and search members by selecting Community > Members. Here you can view member submissions, their comments, registration details, and last login. You can also moderate content from here. All of the user data that you capture on registration is stored in the 'personal info' or 'extended info' area. This lets you capture and access valuable marketing data about your community. Publishing content is the third key pillar of the New Spark Platform. A variety of organizational tools are available through the platform such as collections, groups and channels. 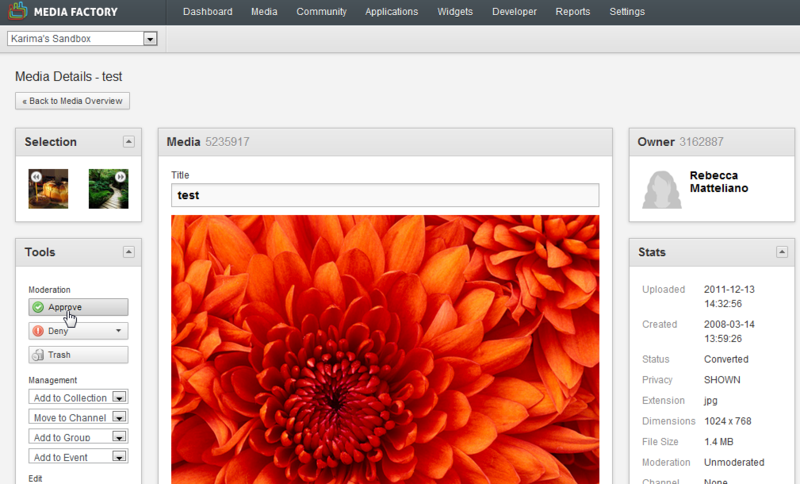 Display your content via gallery and slideshow widgets, RSS feeds, and APIs. Manual Collections allow you to arrange the content in any custom order you wish. Saved Search Collections allow you to automate your gallery stream to showcase by various categories like 'most popular', 'most recent', 'highest rated', and 'most commented'. These collections can be used in web or mobile applications as well as RSS feeds. Don't have a website or want to create a new micro-site for your campaign? New Spark Platform has a suite of web applications that can be installed on-demand and completely customized. The translation engine allows you to produce multi-language websites and also acts as a localization service. This allows you to change configuration options or offer targeted content to demarcated URLs within the same application. The translator tool also allows you to control contest dates and phases. If you are looking to completely customize your application, then APIs may be what you're looking for. APIs allow you to use our data layer and platform infrastructure. This allows you to build and host your custom web or mobile experience. If you are a developer and working with API's, you need to know your project ID (also called a vHost ID) and your API key. The project ID is embedded in your URL. To locate your project ID and API key, in New Spark Platform, from the Navigation bar, click Developer > Developer. Lastly, Media Factory comes with a series of reporting tools that allows you to gain useful insights into how your campaign is going. Enter your search parameters, date range, and pull a .csv report for views, uploads, comments, registered users, bandwidth and storage. Be the first to comment on Getting Started.